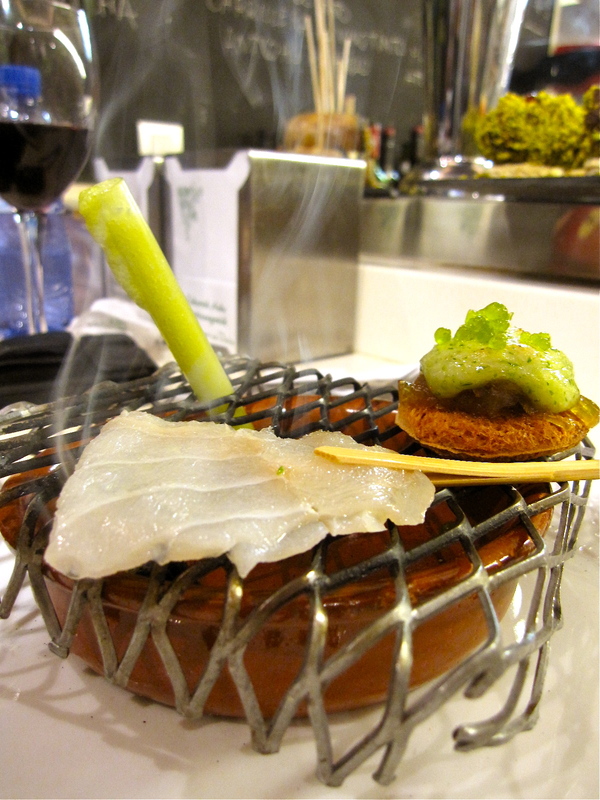 I’ve been here only twice but already Bar Zeruko is one of my favorite pintxo bars. 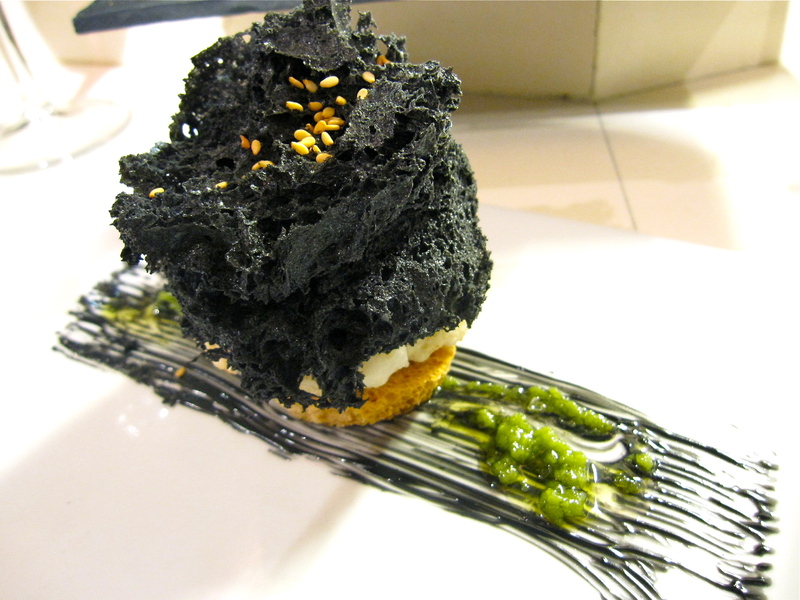 The chefs incorporate innovative techniques and flavors into their pintxos while maintaining some of their Basquenticity. So far I have consumed at least 10 different pintxos and not been disappointed. If this was the case in Boston, perhaps I’d take credit for consistently picking ‘the winners’, but only because I’ve lived in Boston all my life and am somewhat experienced at deciphering menu marketing jargon, aka reading between the lines or weeding through the bs. No, it’s not me. Zeruko just gets it right. 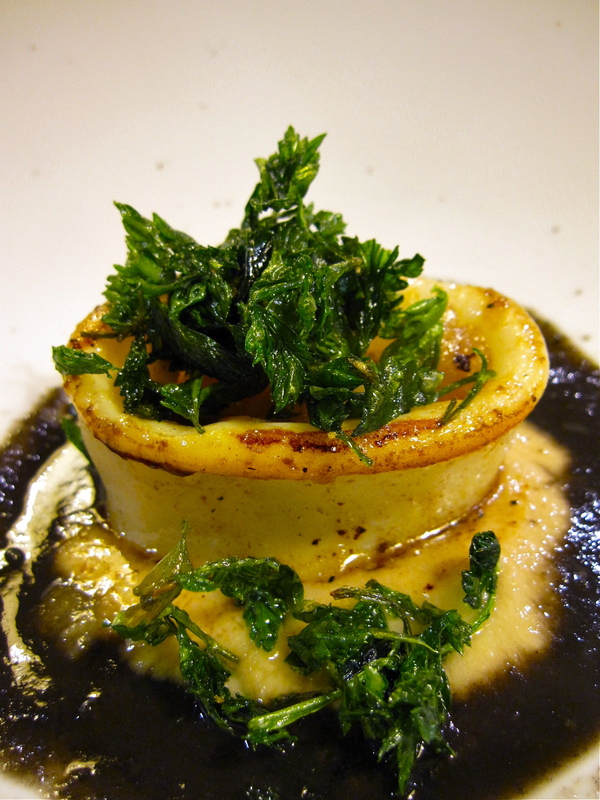 Who would think to pair cod jowl with foie? 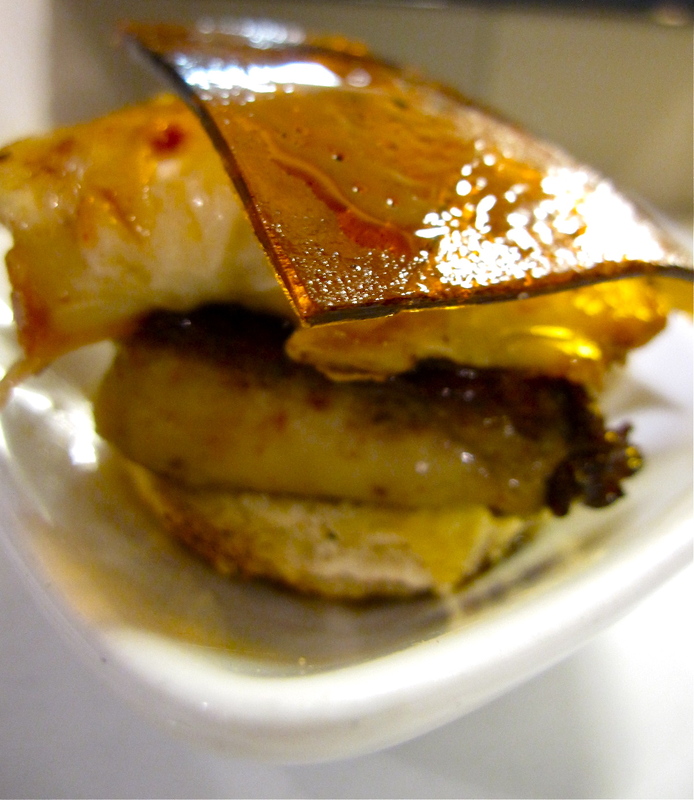 The unlikely pair fare well together because the foie is neither greasy nor uber rich. The acidity of the gelatinized sherry-like sheet balances the finish so your palate is left feeling clean, and ready for more pintxos. As Zeruko is known for its bacalao, we proceeded to order more. Last time (as in two nights ago), la hoguera seemed to be the crowd favorite. I didn’t order it then because I figured it was all show. In this case I love to be proved wrong. The smoke smell is more potent than it tastes. The actual flavor it imparts unto the tender bacalao is quite subtle and perfectly so. We ate as directed, ‘self-grilling’ the bacalao for one minute on each side then topping it on the herbalicious bread chip. Divine. However, I did find the oozy, fizzy shot of green (perhaps a combination of sparkling wine and some herb purée) to be superfluous. Every txipiron pintxo I’ve had in SS so far, I’ve loved. SS is squid heaven. So fresh, so supple. Here the chefs made the txipiron into a tartare patty (hence, hamburgesa) and seared it on each side just enough to crust, not too much to cook it through. Here texture is everything. Sandwiched between the airy tinta cloud and a crunchy crouton base, the ‘hamburgesa’ is not your typical burger, but it succeeds. Don’t forget to dip in wasabi relish. Tasty, playful and Asianified. By far my favorite pintxo yet. iEpa! And again, I love the family-run business here. Friendly staff and wholesome food. I just can’t get enough. I’ll be coming back for more, for sure. Afterwards, we went to Guillermo’s for some pizza. Spanish pizza? Sin possible. Pero, si! 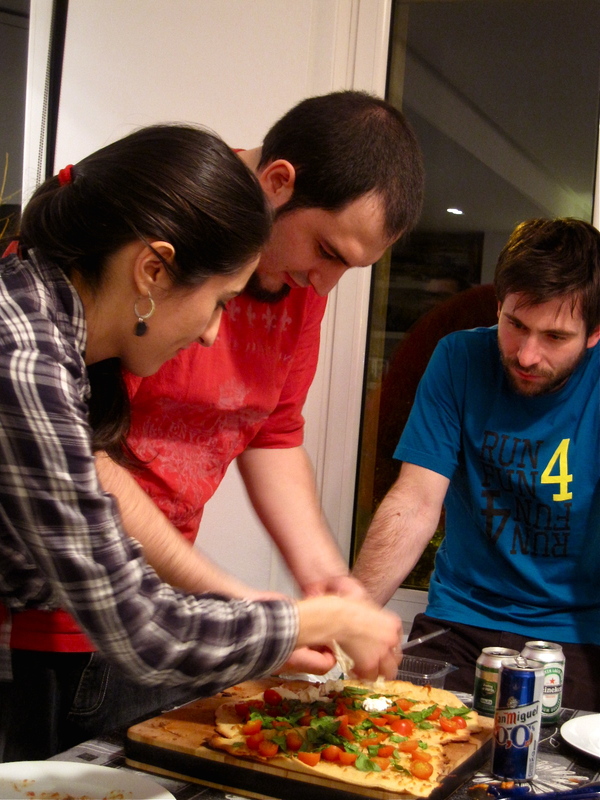 Guillermo rolled out the flatbread and Amaia made the various toppings. They whipped up over 5 whole pizzas for a party of at least 11 or so? Impressive and delicious. Thank you both for a wonderful and delicious evening. Pizza and [vino] Ribera del Duero? I will certainly sleep well tonight!